Heads up, everyone! MSI just announced a time-limited offer. Those who purchase selected MSI motherboards from now until the 31st of March will receive an MSI Interceptor GS B1 gaming mouse absolutely FREE! This gaming mouse is worth US$ 19.99, so if you are already on the lookout for an MSI motherboard, make sure you take opportunity of this bundle! Take a look at the details. 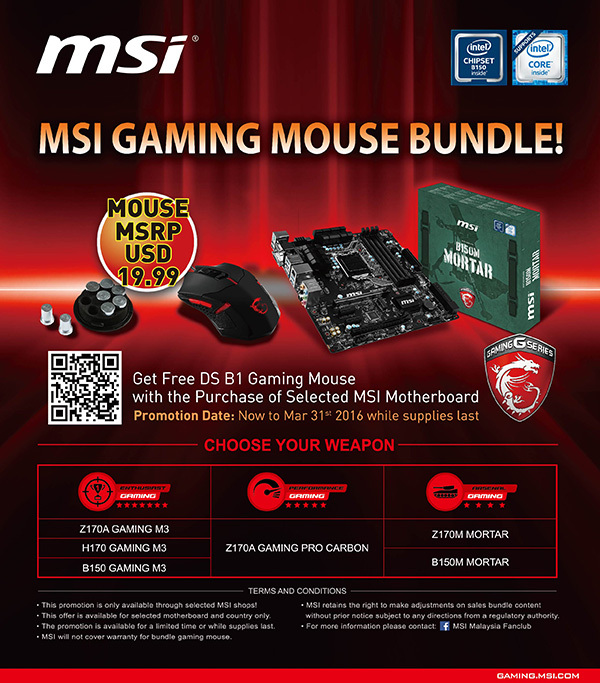 This promotion is only available through selected MSI shops. This offer is available for selected motherboard and country only. The promotion is available for a limited time, or while supplies last. MSI will not cover warranty for the bundled gaming mouse.